Tag line: "He Lived Only for the Flech and the Sword"
While his contributions to horror earned him the honorary title Maestro of the Macabre, Mario Bava also tackled a few other genres over the course of his career, including Sword and Sandal epics (The Giant of Marathon), Westerns (like 1964’s The Road to Fort Alamo), spy thrillers (Danger: Diabolik) and even sci-fi (Planet of the Vampires). 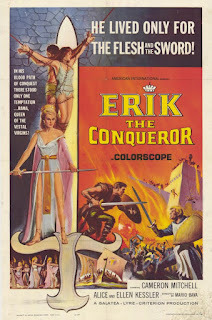 With Erik the Conqueror, Bava took a stab at an historical action movie, and like each and every one of his pictures, it’s the imagery that makes this 1961 film so memorable. It is the 8th century A.D., and the Viking king Harald (Polco Luill) has established a small outpost on the shores of Britain. Unlike other chieftains, Harald’s intentions are peaceful, but that doesn’t stop the British Lord Sir Rutford (Andrea Checchi) from launching an all-out attack against him. Ignoring the orders of his master, King Lotar (Franco Ressel). who wanted only to negotiate with Harald, Rutford slaughters the Viking chieftain and many of his followers. Only Harald’s young sons, Erik and Eron, survive the ordeal. Eron is taken back to the Viking homeland, while Erik remains in Britain, where he’s adopted by Queen Alice (Françoise Christophe), the wife of Lotar. Twenty years later, Erik (George Ardisson), now an honored member of the British Court, is granted the title Duke of Helford, while his brother Eron (Cameron Mitchell) becomes the new king of the Vikings. With the help of the deceitful Sir Rutford, Eron, eager to avenge the death of his family (Eron believes Erik died in the raid), sneaks his army into Britain and captures Queen Alice, who is whisked away to the Viking homeland. Hoping to rescue her, Erik sails north, where he is aided by by the lovely Rama (Alice Kesslan), the twin sister of Eron’s new bride Daja (Ellen Kessler)! With Sir Rutford pulling the strings, Eron and Erik prepare to square off against one another. Will they discover their familial bond in time to prevent this war, or are the two brothers destined to destroy each other without ever knowing the truth? The story isn’t original; the basic premise of Erik the Conqueror was lifted from Richard Fleischer’s 1958 movie The Vikings. But Bava’s keen eye for visuals carries this entire production to another level. Even the simplest of scenes, like an early moment along the shoreline (where Queen Alice first sets eyes on a young Erik), is strikingly vibrant. In addition to its imagery, there is a Viking dance sequence that is well-staged, and the various action scenes are exciting (the storming of a castle late in the film is particularly thrilling) and occasionally quite violent (a woman and her infant are both speared during the opening battle). 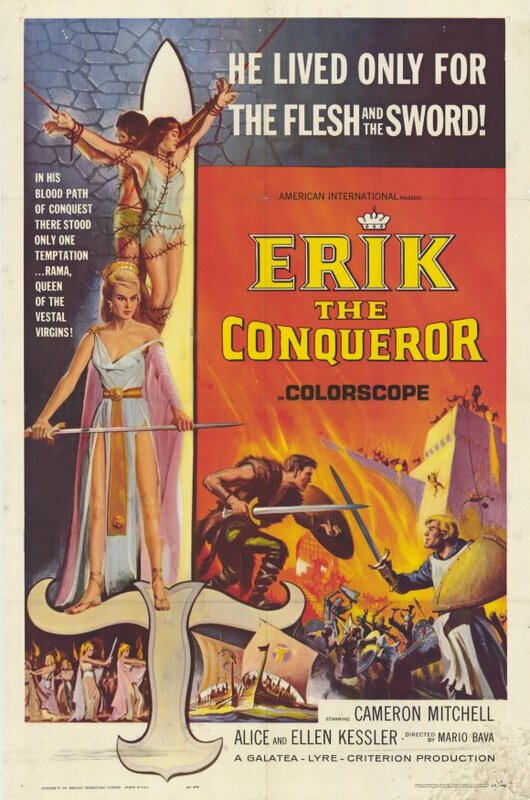 As with his horror movies (Black Sunday, Black Sabbath), Bava’s prowess as a visual artist is on full display in Erik the Conqueror, taking what otherwise might have been an average action/ adventure and transforming it into something much more substantial.